.......walking with a famous Cuban cigar in your mouth…. 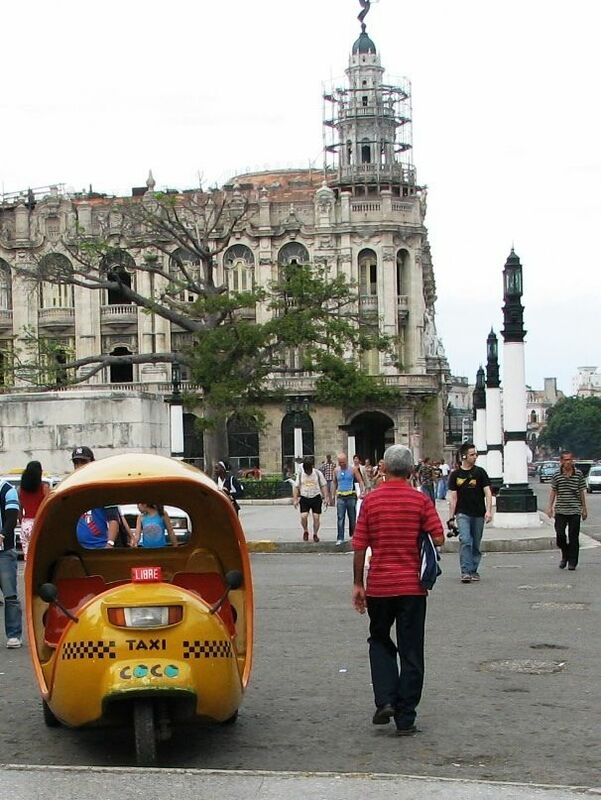 Welcome to La Ciudad de San Cristobal de la Habana as part of your travel around the world! In my first trip to Cuba, as probably most tourists visiting this island, I ended up in an all inclusive resort. For some reasons I selected Cayo Coco - located on one of the islands belonging to the Jardines del Rey (King’s Gardens). This paradise of beautiful beaches linked to the mainland by a 27km long artificial causeway has everything a sun-and-fun hungry tourist may dream of. It did not take me long however to realize that the artificial causeway created a barrier between two different worlds: one of luxury full of often spoiled westerners spending time mostly at the bars and the second one – the world of what me may call - the poverty with a genuine dignified and smiling human face. Let me share with you the story that may tell it all (but first few pictures to introduce you to the ambiance of the Havana's streets). Do you already feel the atmosphere of the past on these streets? But that event helped us to realize that during these vacations we are on the wrong side of the fence. You just cannot truly “visit” any foreign country without getting in contact with local people, without sharing their experiences, feeling their emotions and this is especially true in Cuba. In this seemingly long moment of reflections we quickly decided that our next trip to Cuba will be where we can meet the local people, to chat with them, shake hands, listen to their stories, in other words – to witness their lives. Lives rich not with the modern “stuff”, but rich in what we quite often lost over the last few decades: friendliness and openness, unforced smiles on the faces, joy of living so abundantly expressed on the streets in dancing, singing, joy of just “being” so convincingly expressed by the body language… So here we are – renting a small room from the Cuban family in Havana and wondering on the streets of this charming although full of contrasts capital. Would you like to take a taxi? And please – I’m not expressing here any socio-political opinions; I’m just enjoying my life with new made amigos– this time en La Ciudad de San Cristobal de la Habana! Hasta la vista! On the left: Pictures of Capitol in Havana City show a lot of similarities to the US Capitol. Once a a seat of the Cuban Government, now it is a home to the Cuban Academy of Science and the National Library of Science and Technology. I hope that these Havana city pictures and all that comes with them – photos of old cars being by themselves a kind of living museum of art and ingenuity, pictures of old colonial streets, photos of sophisticated facades – some renovated, some in bad shape, pictures of old and unexpectedly new churches… and still suspended around the spirit of Cuba’s Great Admirer – Ernest Hemingway - will touch your soul and refresh sentiments for the "old good times". I’m sure you will enjoy this visit to the Havana City (and Cuba) in pictures.